All season long, PFF will be ranking the best performing NFL rookies as they race for Rookie of the Year. With just a week left of the season, the race to be the highest graded rookie from the 2017 NFL season is heating up. Below is our weekly rookie rankings after the Week 16 games. PFF Elite Stat: White has allowed a catch just once per every 16.3 snaps he’s spent in coverage this season, the 11th-best rate among 123 qualified cornerbacks. It took him 15 weeks to get to that No. 1 spot, but White has now held it down for two straight weeks as we head towards the final week of the season. White currently ranks third among cornerbacks in terms of overall grade and he’s finished only three games all season with a grade below 70.0. The star rookie out of LSU has allowed just a 64.6 passer rating into his coverage this year and he’s been directly responsible for an incompletion (whether it be via pass breakup, interception or proximity in coverage) on 24.7 percent of the targets into his coverage, the seventh-highest rate among corners. 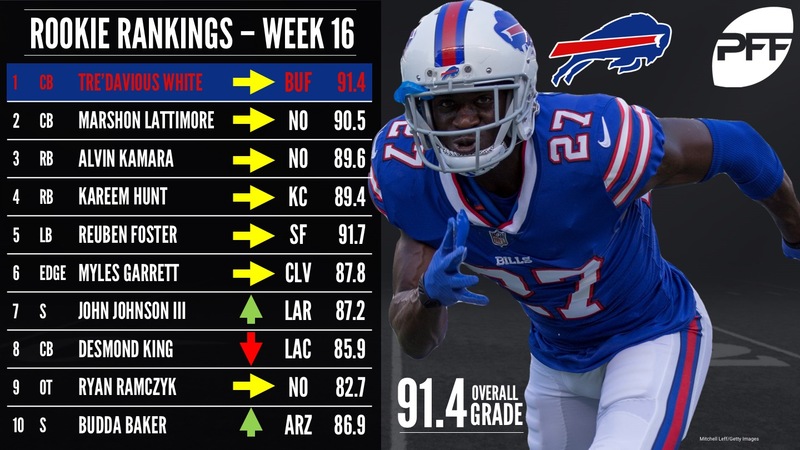 White leads all corners with 1,022 defensive snaps played this season and his elite play over that stretch is a big reason why Buffalo will be playing for a playoff spot in Week 17. PFF Elite Stat: Lattimore has allowed just a 43.2 passer rating into his coverage this season, the third-lowest allowed by any qualified CB. Lattimore had his hands full with Falcons WR Julio Jones last week – who caught 6-of-9 targets with Lattimore covering him for 140 yards – but even with that result he still enters Week 17 ranked fifth among cornerbacks in terms of overall grade. Lattimore has forced an incompletion on 22.6 percent of the targets into his coverage, the 18th-best rate among corners, and he’s allowed a first down or touchdown on just 27.4 percent of the targets into his coverage, which is tied with White as the 16th-best rate among corners. Lattimore led this race for a good chunk of time during the middle of the season, can he put up a big enough game against Jameis Winston and the Buccaneers to reclaim that top spot to finish the year? PFF Elite Stat: Kamara leads all RBs with a 110.4 elusive rating this season. Kamara holds the top spot among offensive rookies as we head into the final leg of this race, but the margin between him and the guy right below him is razor thin – how they perform next weekend will have a big impact on who ultimately ends up on top. Kamara currently ranks third among running backs in terms of overall grade and his 92.9 receiving grade trails only Todd Gurley. Kamara has picked up a first down or touchdown on 34.2 percent of his carries this season, which ranks first among RBs, and among all offensive skill players he ranks third with an average of 2.71 yards per route run, trailing only Julio Jones and Antonio Brown. PFF Elite Stat: Hunt has had 18 rushes this season of at least 15 yards, the most among running backs. Just a month ago it looked like Kamara was ready to blow by Hunt in this race, but with just one week to go, our race for PFF’s Offensive Rookie of the Year really couldn’t be any closer. The third-round pick out of Toledo has finished each of his last three games with a grade of at least 70.0 (including a 90.1 mark in Week 15 against the Chargers), which gives him 10 games on the season above that threshold, and his 88.3 rushing grade for the year ranks first among running backs. Hunt has been one of the best in the business all season when it comes to forcing missed tackles: He’s forced 75 which leads all HBs and Le’Veon Bell is the only other back to have forced at least 60, and he’s touched the ball 82 more times than Hunt. PFF Elite Stat: Foster ranks fourth among all linebackers with a 11.4 run stop percentage. Foster has been one of the best linebackers in football from the moment he stepped onto the field and if he had more snaps under his belt, there’s a good chance he’d be leading this race right now. He currently ranks fourth among linebackers in terms of overall grade and along with Lavonte David, Bobby Wagner, Sean Lee and Luke Kuechly, he’s 1-of-5 linebackers to rank within the top-10 in both run defense and coverage grade. Foster has earned a positive grade on 20.8 percent of his snaps spent in run defense this season, a rate that leads all linebackers, and just 28.6 percent of the targets into his coverage have resulted in either a first down or touchdown, well below the league average of 36.2 percent. With Foster anchoring the defense – and a certain QB acquisition on the offensive side – the future looks bright in San Francisco. PFF Elite Stat: Garrett ranks eighth among all edge defenders with 16 hits and sacks since making his NFL debut in Week 5. Garrett has been sensational ever since he’s been healthy, and heading into Week 17 he ranks 15th among edge defenders in terms of overall grade. He’s one of just nine edge defenders who own both pass-rush and run defense grades of at least 85.0. The first overall pick has graded below 70.0 just once so far as a pro and he’s finished five of the nine games he’s played at least 30 snaps in with a grade of at least 79.9. Garrett has tallied multiple pressures in every game so far (he even had two sacks on just 19 snaps in Week 5) and he’s recorded at least three pressures in all but two games. He’s also received a negative grade on just 2.7 percent of his snaps spent in run defense this season, the seventh-best rate among 104 edge defenders who’ve played at least 100 run defense snaps. PFF Elite Stat: Johnson ranks seventh among safeties with a 6.5 run stop percentage. While much attention has been given to the offensive renaissance happening in Los Angeles, the star-level play of their rookie safety has somewhat flown under the radar. Johnson currently ranks 10th among safeties in PFF overall grade and he’s one of just six safeties to rank in the top-20 in both coverage and run defense grade. The 91st overall pick out of Boston College had another strong performance in Week 16 (85.7 overall) and his consistent play has anchored the back of the Rams’ defense. He’s earned a grade of at least 70.0 in all but two games this season and he’s now passed the 80.0 mark five times. Johnson has been one of the best tackling safeties in football this season as his 7.1 missed tackle percentage is the sixth-best among safeties. He’s also shown a penchant at disrupting the catch point in coverage: his 24.3 forced incompletion percentage ranks ninth out of 79 safeties who’ve spent at least 200 snaps in coverage this season. PFF Elite Stat: King is one of two cornerbacks this season to have spent at least 300 snaps covering the slot who have yet to allow a touchdown from the slot. King currently sits at 12th among 121 qualified cornerbacks in terms of overall grade and he’s posted a game grade of at least 70.0 in nine of 14 games as a pro. King has been a near-seamless fit into the Chargers’ defensive scheme and he’s shown an ability to effect the game in multiple ways: he leads all corners with 23 stops in the passing game, his 4.7 run stop percentage ranks fourth among his peers and he ranks first with a 33.3 pressure percentage out of 15 cornerbacks who’ve rushed the quarterback at least 20 times this year. During draft season, many analysts weren’t sure where King would fit on an NFL defense, looks like the Chargers had that one figured out all along. PFF Elite Stat: Ramczyk ranks 10th among tackles with a 96.7 pass blocking efficiency. A steady presence on this list – and on the Saints offensive line – Ramczyk currently ranks eighth among all tackles in terms of overall grade as he’s finished just three games all year with a game-grade below 70.0, with two of those coming in the first four weeks. The final pick of the first round has more than held his own in pass protection as a rookie as he’s allowed pressure on just 4.3 percent of his pass-blocking snaps this season, the 12th-best rate among tackles. Ramczyk is a big reason why Drew Brees has faced pressure on a league-low 22.4 percent of his dropbacks. PFF Elite Stat: Baker leads all safeties with a 10.5 run stop percentage on plays where he’s lined up within eight yards of the line of scrimmage. The only player to make their debut here this week, Baker has been fantastic since he started receiving regular playing time in Week 10. The second-round pick posted an 86.8 overall grade that week and then he followed it up with an unbelievable 99.4 PFF grade in Week 11. Since making his true debut in Week 10, he’s finished 6-of-7 games with a grade of at least 70.0, he was over 80.0 in five of those, while in two of those games he broke the elite 90.0 threshold. Baker has been truly special in run defense these past seven weeks as he ranks third among safeties with an elite 90.4 grade and his per-play grading has been off the chart. On average this season, a safety earns a positive grade on fewer than five percent of their run defense snaps. Baker, on the other hand, has scored a positive grade on 13.9 percent of his run defense snaps. The Cardinals lost one of the better run-stopping safeties in football from last year in Tony Jefferson, it looks like Baker is more than ready to take over that role full-time.